Fact: Time can’t be replaced. Your time is not limitless. You can’t work harder to gain more time. Time wasted cannot be replaced. If you’ve attempted to manage your time in the past, but still failed to reach your goals, it could be that you’re too flexible and easy on yourself and others when it comes to your schedule. When you realize that time is finite and that there really might not be some future distant tomorrow, you might start being more ruthless with the time you’ve got. * Just Say No – The biggest factor in being ruthless with your time is learning to say no when it’s appropriate to do so. When we’re asked to do something, we need to consider our time schedule and our priorities. None of us possess super powers. We only have so much energy and time to spend. Now, I’m not saying we can’t push ourselves at times when there is someone who really needs us. What I am saying is that we need to be wise when considering requests of our time and also our priorities before responding. We can’t say “yes” to everything and still manage all of our priorities and conquer our goals. * Get Up on Time – This is a hard one for many of us, but it doesn’t have to be hard as you think. Go to bed on time so that you can wake up at a good time. Unless you have health issues, you do not need more than seven or eight hours of sleep each night. If you can limit your sleep to no more than eight hours, you will gain more time. On the other hand, if you typically sleep less than six hours, you may actually need to get a bit more sleep to be most productive with your time. Having trouble waking up in the mornings? * Try to Be Early – One of the ways to eliminate urgency from your life, which in turn causes stress and can cause problems with time management is to schedule your time to arrive early to appointments and meetings. This way if something does happen out of the ordinary, you will still have time to meet a deadline and be on time. * Turn Off Technology – The very thing that is supposed to make our time more productive can have the opposite effect also. The notifications of new emails, your Facebook stream, and unscheduled time spent browsing on Pinterest can get out of hand. Turn it off. You’ll gain so much more time. That includes your TV, too. * Understand Your Internal Clock – Everyone has an internal time clock. Some people are early risers and some people are night owls and others are in between. It’s important to determine for yourself how your own internal clock performs and then work with it. Do your most important tasks when your energy peak is at its best. * Make Lists – If you understand each step that goes behind a calendar listing, it will be more beneficial because it’s easier to allocate enough time for each step when you know what it takes to complete any given task. You won’t be able to accurately determine the time frame needed without all the information. * Put it on the Calendar – Put everything on your calendar including everyday tasks, small steps for a project due in the future, and time with family, friends and yourself. Don’t skip this step so that when someone asks for your time you can easily schedule them in (or not) based on your availability. 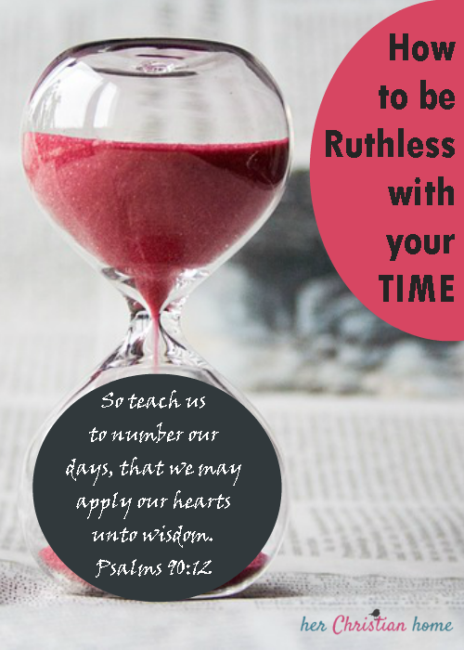 * Avoid Time Wasters – Be aware of where your time leaks away. For example, if the phone rings frequently, it can really dwindle your time away and interrupt your momentum in accomplishing work. Set specific hours aside when you will let the answering machine take over your calls so that you can work full force ahead on your projects. * Touch “It” Only Once – Another way to be ruthless with your time is to not allow yourself to wait to do things later. If you get an email that requires a response, do it now. If you check your snail mail and a bill needs to be paid, schedule it now. Immediately toss out the junk mail. If you get junk email, delete it now. Only check your mail when you have time to deal with these issues. Yes, be ruthless about your work schedule, but also schedule in fun time. Human beings aren’t designed to work 20 hours a day. Go ahead, schedule 8 to 10 hours a day of work, but don’t forget to schedule in breaks. Time with friends, family and your spouse during any given work day is also important. *Also, remember to schedule in breaks like weekends and vacations. If you do that, it’ll be so much easier to be ruthless with your time and stick to your normal schedule. It has taken me a long time to learn how to say “no”. Thank you for a good article. Thanks I really enjoyed this article about time. I found it to quite be helpful. Looking forward to reading. More of your articles. God bless! Patsy, you’re welcome. So happy to have you stop by…thanks for taking time to comment!